Craving for some snacks? Try this healthy alternative, conveniently packed for variety of choices. Muscat raisins are larger than the common raisin and also darker in colour. Produced from the Alexandria grape, Muscat’s are very sweet in flavour. They are unsulfured, organic and range from golden color to brown. 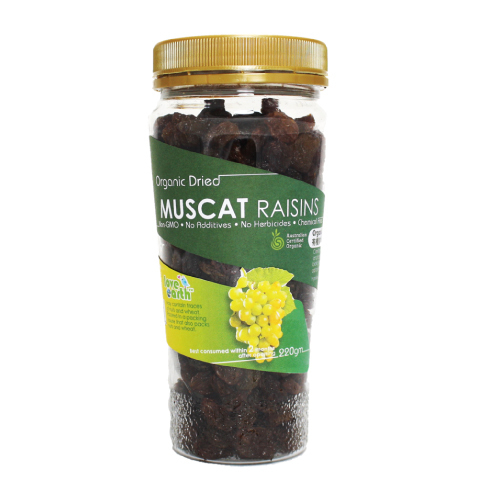 Now you can enjoy muscat raisins in dried form, anytime, anywhere! Energy booster – Rich in carbohydrates, especially natural sugars, they give you a quick boost of energy - without weighing you down. Consume direct as a snack. Add dried muscat raisins to hot or cold cereal. Add some dried muscat raisins to the batter when baking cakes, muffins or pancakes.